Overlooking the Tennessee River, Gorham’s Bluff in Pisgah, Alabama was the most gorgeous venue I’ve ever been to. Getting to go celebrate Wesley and Rebekah’s vow renewal was such an incredible experience and Madison and I were very blessed to get to go photograph it! 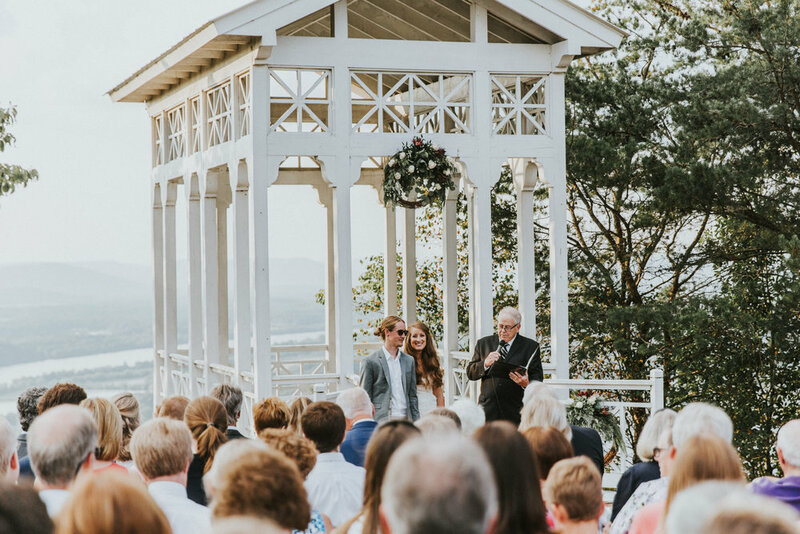 Wesley and Rebekah actually eloped at Gorham’s Bluff back in March, so when they came here this September to celebrate with friends the vibe was very relaxed and inviting. It was nothing like a wedding I’ve had before - everyone was calm and the energy was just very excited and friendly and welcoming. From the getting ready process to family photos to portraits to the vow renewal/celebration and the reception it was just good. We loved our time with them! Since they were already married they got ready in the same room! There was no first look or grand reveal and it was actually super cool! The vow renewal ceremony - it was actually more of a “blessing” ceremony, where multiple family members from either side came up and said blessings for them and their marriage, and recalled some favorite memories. Sunset(ish) from the crow’s nest at Gorham’s Bluff. I think those mountains in the distance are the smokies but I honestly don’t know. Yay! two things. 1.) if you want your reception to go from good to great, hire a (good) live band instead of a dj. 2.) this band, act of congress (link) is incredible. so good. so talented. vaguely christian and oh so kind. Rebekah was not concerned about messing up her dress and I’m super cool with that. Just a couple of lovebirds! They actually dated for 10 years before getting married. I met Wes and Rebekah a few years ago when Wes hosted a longboard race at Mt. Cheaha in Alabama. I either hadn’t started or had just started photography at that point and had no idea I would ever be photographing weddings. It was so crazy to be back with them in this context after staying aware of each other via social media for about 3-4 years. God’ll do it! As your photographer, I believe that I can help make or break the day. I definitely want to help MAKE it. My goal is to ensure you have the least stressful day/trip possible and that every time you think “oh this would be a good photo for Zac to take” and you look to me to tell me I’m already getting the shot and you can refocus on more you relevant stuff. Besides your marriage, what I do will be the only thing that lasts after your wedding. Probably even past when you and your spouse are long deceased. As such, I believe it’s so important for me to do what it takes to get the best shots possible and to do a perfect job documenting the story of your day. Jesus changed my life and I want to love like He does! It’s not my job to judge you (or anyone) based off religion, who you love, or anything else. Even if we disagree on some things I think we should come together to make super good photographs! Obviously I have a business to run but I will do what it takes to make sure you get what you need. If something crazy happens to the schedule during the day to cause delays or something else and (for instance) the exit is pushed back 30 minutes and you were really hoping that you’d have photos of it, I’ll stay to make sure it happens - no extra charge. Don’t abuse it but I’d rather be home a little later and know I’d done everything I could to make your day as flawless as possible!